The Hallstatt-Dachstein Salzkammergut Cultural Landscape is an area of great prosperity originating from salt production, which is "reflected in the fine architecture of the town of Hallstatt". Its name is forever linked to European prehistory for a discovery of early Iron Age remains, which became the type site for the Halstatt culture. The designated area covers over 280 square km. In addition to the town of Halstatt it also includes the Halstätter Lake, the Dachstein massif, the town of Obertraun and the surrounding areas. The Dachstein mountains are renowned for their caves, among them a large ice cave. The best WHS require some effort to get to. That's also the case with Halstatt, at least when you're using public transport. I went out there on a day trip from Salzburg. The journey required a bus ride (1.5 hours, bus 150 to Bad Ischl), some waiting at the train station, a 40 minute train ride and finally the 3 minute ferry across the Halstatt lake to the town proper. The scenery is interesting enough all the way. Although I visited in winter, there was not much snow on the ground. The closer you get to Halstatt, the Alpine peaks get more impressive and they were snow white of course. 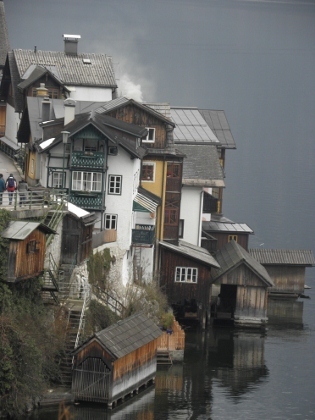 Halstatt is a popular tourist destination, especially among Asians. A bunch of them (young Chinese) shared the same bus with me. We all anticipated the first view of the town across the lake, as we had already seen so many pictures of that. I discovered that the iconic pictures mostly are taken from the side of Halstatt itself, not from the other side of the lake. There are some uglier buildings on the lake front that are never shown. Also there are cars and a parking lot, somehow I always had thought that the town was inaccessible by car (it's just blocked on one side). Nevertheless these minor misgivings, I enjoyed strolling around. I took lots of photos, it's so extremely picturesque. I also visited the World Heritage Museum, which in effect is a local museum that tells the story of Halstatt during the ages. The best is saved for the final rooms of the exhibition: that's were several of the Iron Age treasures are shown that have been here. They have been in a museum in Vienna before. The weather prevented me from a longer visit: it was pretty cold, and the parts on the Dachstein mountain are closed in winter. Even the town's statues and fountains were totally hidden benath wooden covering. On an organized trip to Salzburg, the tour had a surprise stop at this UNESCO site while the bus driver took a break. It was completely gorgeous-we saw a cold December mountain lake. I didn't get to spend too much time (only 30 minutes) but what I saw was really wonderful. Visted Hallstadt on our trip September 2014. The cultural landscape is interesting and we even had a swim in the Hallstatter See (brrr). However visting the WHS is pretty hard. The prices are horrendous, and no parking is available for Campers. But the old town at the lake is quite intersting. I visited this WHS in April 2014. It is quite hard to understand why such a site is not inscribed as a mixed site at least when it has such a natural setting. The wooden houses are really picturesque and there is an interesting World Heritage loop trail which gives you an interesting overview of the city. The WH Museum is an interesting place to visit to better understand the OUV of this site. The highlight of my trip were the painted skulls in the Beinhaus. They are really unique and just outside there is a tiny graveyard with a wonderful view of the mountains and lake. I was one of the only European tourists around. The vast majority were Asian tourists - I think it must be among the Top 10 places Asian tourists visit in Europe for some odd reason - no wonder the Chinese built a replica! I’m not sure I have been anywhere quite as picture perfect as Hallstatt. You would really need a hard heart not to swoon at the incredible mixture of the town, lake and Alpine peaks, especially if you arrive by train and have to bob across the water from the station to the town centre. Hallstatt is certainly small, but a little larger than I had expected, which was good in absorbing the large number of people visiting. I rather enjoyed ducking off down little side streets and climbing up flights of steps to find new viewpoints. One of the highlights of these explorations was the Beinhaus, which was home to the decorated exhumed skulls of the town’s former inhabitants. Like the others here I enjoyed the museum in the centre which does a great job of explaining why this whole area is a world heritage site. 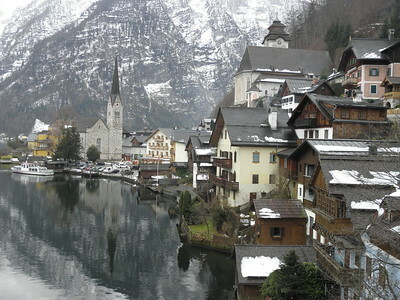 It is especially good at highlighting the importance of the area during the Hallstatt era (3,000 thousand years ago). Its displays showed that this place wasn’t on the World Heritage List just because it looks quite pretty, but rather that at one stage it was the centre of a large cultural sphere. In saying that the interesting exhibits on the areas mining heritage couldn’t convince me to stump up the high fees to visit the Salt Mines above town. The cost of a visit is one thing to keep in mind if you are visiting, my day trip from Salzburg ended up being one of the more expensive excursions I have made in hunting out WHS towns. I guess this is due to its remote mountain location, however the general attrition of mounting small fees and things being just that bit more expensive than I thought they were worth did somewhat detract from the overall experience. On the whole I did enjoy my trip out to one of the most picturesque places I have ever visited, and I would thoroughly recommend a trip to the lovely little museum which explains why this place has been important for thousands of years. I agree with the other reviewers this should have been a mixed nomination. 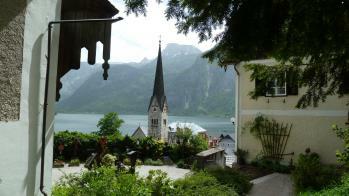 Nonetheless, Hallstatt as a cultural site has a lot to offer too. The current town has some beautiful architecture, but I think its archaeology (the Hallstatt Culture) is what renders it so important. This can be well experienced in the new World Heritage Museum which offers very detailed information about the history of the this place. It also managed to receive back all exhibits from the famous graves uphill that used to be on display at the Vienna Natural Science Museum and are now on display here. You can also visit the graves themselves near the entry to the salt mines. A worthy WHS to visit. 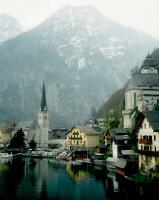 The scenic landscape of Hallstatt, the lake and the surrounding mountains is really marvellous. The architecture of the town with its boathouses can be viewed best from the lake, either with a boat trip or from the ferry to the train station on the opposite shore of the lake. The ascent to the Rudolf tower is also rewarding: You have a wonderful view over Hallstatt, the lake and to the Dachstein massif. You can walk or ride up with a funicular. Not far from the Rudolf tower is the entrance to the salt mine, the oldest salt mine in the world. The highlights here (not only for children!) are the miners' slides, one is 64 meters long. And of course, do not miss the Beinhaus (ossuary) next to the parish church Maria am Berg. The beauty of the town and its spectacular location at the lakeside was extensively described by the previous reviews. But the WHS also includes the Dachstein massif and the large cave system. Three caves can be visited, each is of a different type: the Ice Cave with fascinating ice formations, the Mammut Cave with rock formations in different colours and the Koppenbrüller Cave in the valley, a stalactite cave. Especially the Ice Cave is worth a visit, the tour lasts 50 minutes. If you stay a few days in Hallstatt, you should make a trip to the Dachstein massif. 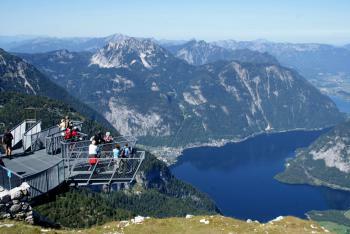 A cable car runs in three sections to the Dachstein mountain plateau. At the upper station of the first section you can visit the Ice Cave and Mammut Cave. The second section leads to the Krippenstein peak. From there you can walk on easy trails to different vantage points with stunning views to the Dachstein glacier, the surrounding mountain peaks and the Lake Hallstatt. "Mountains as far as the eye can see" is one of the slogans - and this is not an exaggeration, on clear days you have a wide panoramic view over the Salzkammergut. The most spectacular viewing platform is the 5-fingers (photo), 400 meters above the ground, the view over the valley and the lake is breathtaking. The Krippenstein peak is also the starting point of a hiking trail through the karst landscape - the Heidelberg circular trail. The walk takes about 2.5 hours and is suitable for less experienced hikers. From the valley station of the third cable car section, you can hike to the Simony Hut at an altitude of 2200 meters, just below the Dachstein glacier. The last part of the trail is very steep and you should be in good physical shape. An alternative route leads over meadows back to the cable car station. I visited the Hallstatt-Dachstein cultural landscape several times in the recent years. There are a lot of cultural and natural sights and I would recommend to spend more than one day there. For dinner I can recommend the restaurant Zauner, the fish from the lake is excellent, in particular the Reinanke (whitefish or Coregonus). I agree that this should have been a combined natural and cultural site. 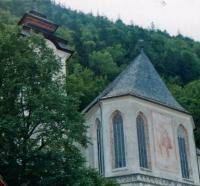 I stayed at Obertraun and took a ferry from there to Hallstatt Markt, returning again later by bus from Hallstatt Lahn. The bus also took me up to the Obertraun cable car station from where I was conveyed in two cars to the summit of Krippenstein, a part of the Dachstein Massif. I hiked from there to the 5 fingers, a lookout that is cantilevered over the edge of a 400 metre cliff. 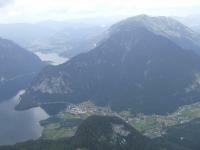 The views over the Hallstattersee and the Dachstein massif were extensive. Descending by the upper cable car I then visited the Ice Cave, a much larger series of ice filled undergound galleries than I had expected. The formations into which the ice had contorted itself was fascinating. I have been once in Halstatt, a beautiful town situated on an artificial promontory (Mülbach), resulting from the dumping of mining debris, and on the strip between the mount Salzberg and the lake; the southern part (18th century) is also called In der Lahn and it’s at the mouth of the valley of Echterntal. In Halstatt are nice tall and narrow Gothic houses (also boat-houses on the lake) that have stone lower storeys with barrel vaults and upper wooden storeys (only a few has saddleback flat roofs with wooden planks or shingles), like on the triangular market square, where is also the column of the Trinity. The main church of St. Mary is constructed on a hill in Gothic style (only the roof and the spire are Baroque; some elements are Romanesque) and has nice windows, a portal, two naves, one apse, sculptures, frescos, vaults and altarpieces also by Lienhart Astl. Near that is the Chapel of St. Michael and the Carmel House, where are the skulls and the bones (marked with names) that couldn’t have space in the cemetery. 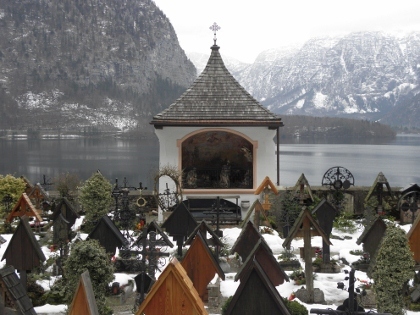 In Halstatt are also the Baroque Mount of Olives Chapel, the Calvary Chapel, the neo-Gothic protestant church, the Baroque almshouses with a chapel and the Tower of Rudolph that protected the salt workings. I was a little bit disappointed by this town because it hasn't important monuments, but its architecture is however of high quality. It is worth to be visited if you are near Salzburg (if you go there you must leave the car outside the centre), but I don't think it justifies the inscription under cultural criteria, but rather under the natural criteria (and with a largest part of the Salzkammergut region), under which is not inscribed, because of the beauty of the natural monuments (even if I haven't seen them) and landscape. It may be hard to pronounce, but this storybook setting seemed like a dreamscape when I visited in 1999. 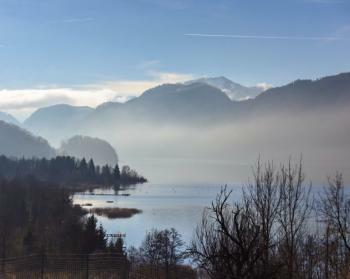 This is what Austria is all about, and this scenic region is a great palce to stop and smell the strudels, so to speak. My stay in Hallstatt lasted for four days so I had plenty of time to explore both the ancient salt mines that has given its name to the landscape, the deep mountain ice caves in the nearby village of Dachstein but also just wonder around in this peaceful alpine landscape. Day-touring tourist might fill Hallstatt during the day but in the late afternoon it all calms down and you can enjoy a rich Austrian dinner together with a cold beer whilst dreaming yourself away to a different time and age. 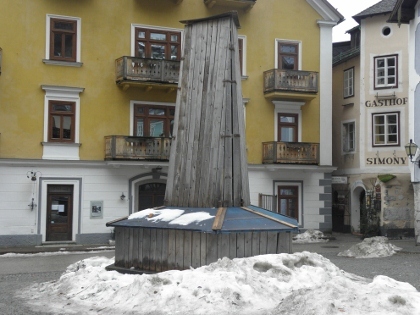 An odd experience is the small “Beinhaus” (bone house) that in its own way illustrates the problem of availability of land and space in Hallstatt. Since the cemetery was so small and without possibility to expand and cremations was forbidden, there was no alternative than to open the graves after 10-15 years and move the bones to the Beinhouse. It’s a tradition that dates back over twelve centuries and today there are over 1200 skulls, half of them painted in a flowery design. I was told that the last skull to go into the Beinhouse was in 1995 so either the folks here have found some new ground for their cemetery or the Hallstätters have actually found the formula for eternal life…! Hallstatt, a small paradise on earth in central Austria is breathtaking with its absolute beauty of natural environment. This place is not a newly jet set luxury resort town, but a human settlement since ancient time because of the richness of salt in this area. Salzkemmergut is the name of this region, a beautiful alpine land with many picturesque lakes and the priceless treasure of old time, salt. I am quite sure that Salzkemmergut has strong relationship with Salzburg, as Salzburg was prospered by salt trade, thus its name and Salzburg is really near to this area. Hallstatt town is the centre of the region with many pretty houses and churches. Unfortunately that I visited Hallstatt before Easter, so the famous salt mine and Dachstein ice cave were closed as well as many tourist facilities, but these made Hallstatt where normally draw thousands of tourists everyday in high season to be more normal town liked not a tourist hot spot. My friends and I walked around this town less than one hour as the town is so small. The main attraction is the town parish church and its cemetery. The cemetery is really small, so the church has to do something with the lack of space problem, as a result, this church has policy to dig the bones up and put them in the small house where tourists come to admire a pile of skeletons and skulls! I really recommend everyone to take a walk along the lake shore especially on the right bank. The walking path will lead you to see many beautiful lake scenes, in some spot so dramatic liked Norway fjord. Hallstatt is well connected to Salzburg and Vienna by train. I think the train route from Attnang P to Hallstatt is worthwhile by itself with amazing scenery. Hallstatt train station (I'm not sure I can call it a station or not) is on the right bank of the lake, while Hallstatt is located on the left bank, so you need to take a ferry to the town, a really good way to enter this charming place. As the name implies, the region of Salzkammergut, stretching across three Austrian provinces (Upper Austria, Styria, Salzburg) became important through the production of salt. Today, this industry still exists, even though on a much smaller scale. The little town of Hallstatt still has reminders of its former wealth that came with the salt. Now it relies mostly on tourism, since it is located on a beautiful lake with one of the Alps' most stunning vistas. It is also important for its many prehistoric findings - a whole neolithic culture was named after the place. The Dachstein is one of Austria's more famous mountains, located in an almost untouched region of high mountains, deep valleys, and evergreen forests. Except for Hallstatt and a few other places, few visitors come here, which is both a blessing and a pity, since it is one of Europe's most beautiful areas. I don't know exactly why it was nominated only as a cultural landscape, because its natural properties are at least as important. When we arrived in Hallstatt, we knew we had found one of the more beautiful places in the world. Pictures of Hallstatt, a picturesque, beautiful lake-side village, are often used for a calendar, a jig-saw puzzle, or a greeting card. People have lived here for 3,000 years, and it's easy to see why. There were 6 or 8 waterfalls and streams coming down the mountain, through the town. They had built garages on stilts, out over the water, to keep the boats protected from the weather. Next to one church, a couple flights of stairs lead to the town cemetery. Each grave is a separate, detailed, trimmed, precision flower garden. The "gravestones" are crosses covered by a little roof, and many display a photograph of the person buried there. Built in the 2nd Millennium BC: "systematic salt production was being carried out in the region as early as the Middle Bronze Age (later 2nd millennium BC)." Role of Women: The transportation of the salt from the mines uphill to the town and port was carried out by the women. There is a bank at the slopes of the mountain where they used to rest on their way down.